Summary: The protocol described below includes equipment needed and the procedure on how to assess earthworm abundance and diversity in urban habitat patches and reference sites. Earthworms are among the most significant soil invertebrates affecting soil physical, chemical and biological properties and soil functions. 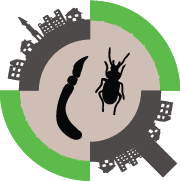 They may occur in urban environments even if the climatic conditions and surrounding natural biome does not support them. Urban soils are often dominated by peregrine, synanthropic species leading to a more homogenous fauna. 25 cm x 25 cm quadrats. We recommend a 5 cm deep metal frame, because it can be pushed slightly into the soil. 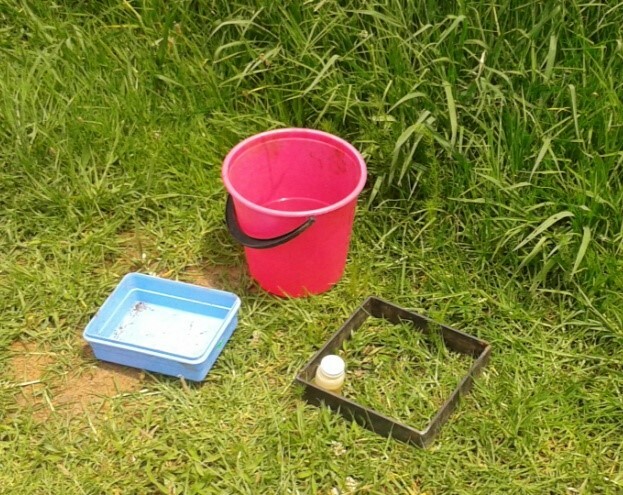 This reduces runoff of the extraction fluid, and prevents earthworms moving in and out of the quadrats. However, wooden or plastic frame (e.g. PVC pipe) will also work, and it may be more economical. Hot mustard powder. The brand of hot mustard will vary depending on availability. We used Colman’s: http://www.amazon.com/Colmans-Mustard-Powder-16-Ounce-Cans/dp/B001EQ582E/ref=sr_1_2?ie=UTF8&qid=1378148622&sr=8-2&keywords=Colman%27s+powder. Indian grocery stores often sell hot mustard powder (make sure it is not curry!) in large quantities at a low price. You should experiment with a few types to see which works best. Earthworms are extracted using the hot-mustard method. Prepare the hot mustard paste: disperse 15 g hot mustard powder in 100 ml water and let it sit for at least four hours. Note: we recommend that you use the suspension within 8-10 hours. Keeping it longer results in losing its “power”, and becoming stinky. Immediately prior to sampling, add the mustard paste to approx. 3.5 L water (one gallon jar). Mix well by stirring with a stick. Place your quadrats to the ground. 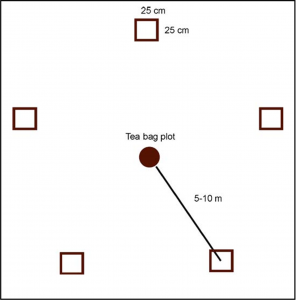 Five 25×25 cm samples should be taken from around the teabag deployment plots (the 5 x 4 grid, see teabag protocol) arranged more or less according to the figure below. Arrangement of EW sampling quadrants. The 10 m distance from the plot is for guidance only. In some cases, the habitat patch may not be big enough, with a large edge effect. Clear all vegetation and leaf litter so that you see the earthworms as they emerge. If your ground cover is grass, clip the blades close to the ground. You do not want to ruin the ground, and you do not want to pull out the roots. Examine plant litter and other detritus carefully before discarding: some species are active in leaf litter especially when it is wet. Pour half of the mustard solution evenly across the quadrat. The worms often emerge right away. After about 15 minutes, pour the remaining solution. Place the emerging worms in a plastic jar filled half in clean water (make sure they do not escape). Note: This techniques works well with most common synanthropic species that are active close to the soil surface. It may not be efficient collecting earthworms living deep in the soil. Sometimes digging might be necessary to make sure you do not miss a large number of these true soil dwellers. Depending on your resources and research interest you may (A) count, weigh and identify the earthworms in the field (B) do only a subset of these i.e. just counting, or (C) preserve the earthworms and identify them later. 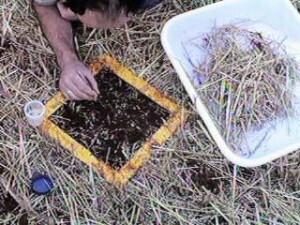 We recommend that at least density (number) and biomass should be determined for each quadrat. Both reflect abundance, but may show different pattern. For instance one may have low density but high biomass if the community is dominated by large species, and there are not many juveniles. If you have the equipment, take temperature and soil moisture measurements. We recommend taking both air and soiling temperature (at 10 cm depth). Soil moisture probes usually go to 5-10 cm deep. In any case, record the depth. Soil moisture measurements should be taken away from the quadrats and before pouring the mustard suspension! If the earthworms are not identified live, they should be killed in 70% ethanol and after the last movement ceased (a few minutes) the material should be transferred to 4% formaldehyde solution. The worms/conservation fluid ratio should be ca. 1:3. After about 2 weeks in the formaldehyde solution, transfer the worms into 70% ethanol. The samples will last either in the formaldehyde solution or in the ethanol for a long time. However, you should check the material to make sure it does not dry out. At the end of the day, discard all the unused mustard suspension and thoroughly rinse the jars. 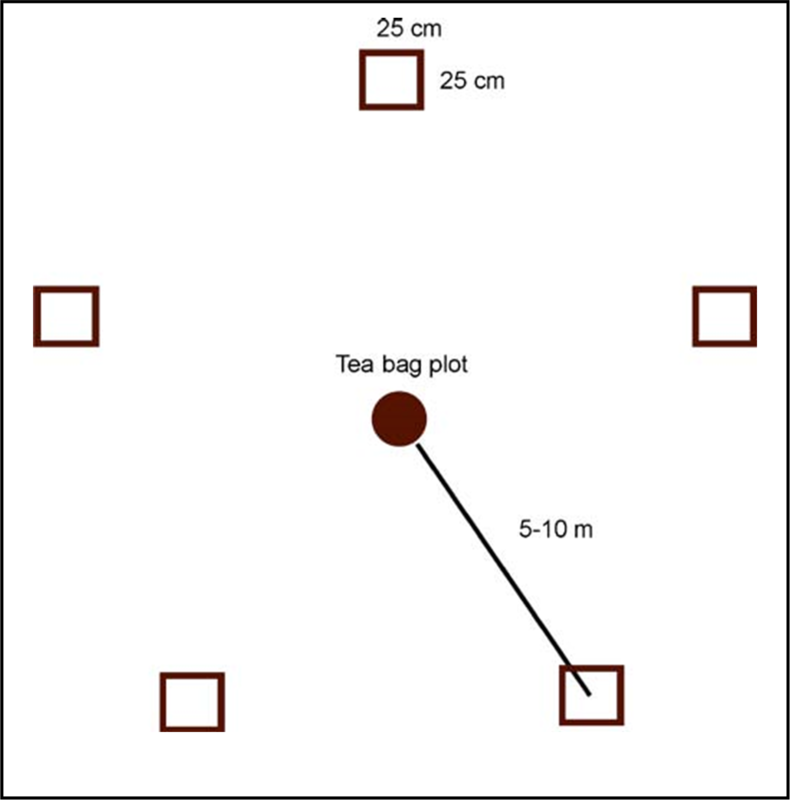 It is important to minimize trampling on and around the quadrats during sampling. Too much foot traffic may drive the earthworms away or to deeper soil. 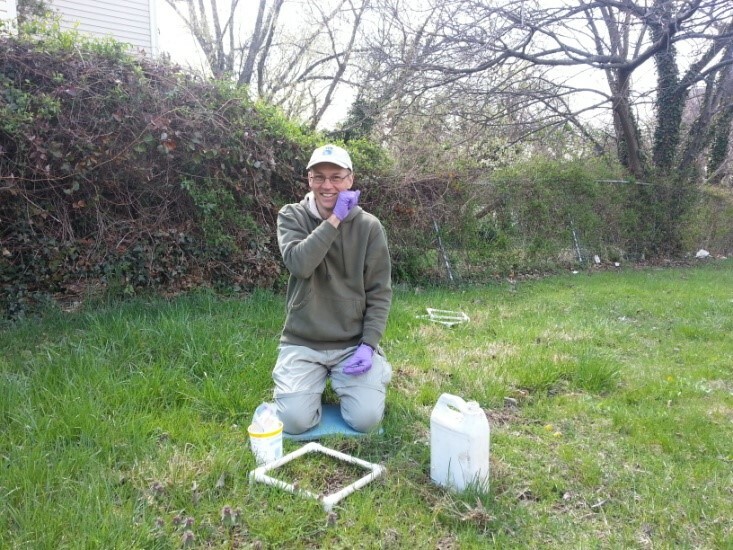 Take samples when soil is sufficiently moist, and the earthworms are active. These will obviously vary by region, climate, and vegetation, among others, but will coincide with the rainy season. In addition, different groups of earthworms reach abundance and activity peaks at different times. For temperate regions in the Northern Hemisphere, the best time would be spring and fall; in areas with only dry and wet seasons, we recommend the end of wet season.